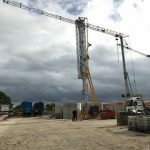 Mantis Cranes is pleased to announce the addition of the Potain HUP 40-30 Self Erecting Tower Crane to its hire fleet, the largest and most diverse fleet of Self Erecting Tower Cranes in the United Kingdom. 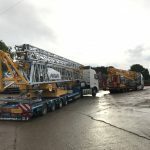 In September we took delivery of two HUP 40-30s, the first of many that will be added to our Pedestrian Operated Tower Crane fleet. 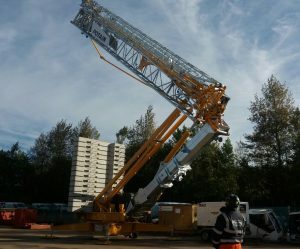 Following a period of training for our Crane Service Team the first of these will be on site during November. 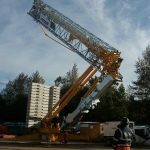 The Potain HUP 40-30 has a 4,000kg capacity and a 40m jib length. Its maximum hook height is 30m, significantly more than other cranes of this size. 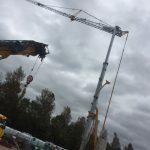 The crane is operated using a wireless remote control. Click here to find out more about the Potain HUP 40-30. 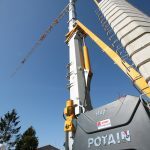 The hoist unit features Potain’s High Performance Lifting (HPL) technology as well as High Performance Slewing (HPS) and an integrated diagnostic tool. The Power Control function allows the crane to operate with a range of power inputs.